An exhibition exploring the origins of ancient skeletons in Sussex, including a woman from sub-Saharan Africa buried in Roman times, has opened. 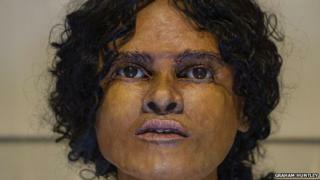 The face of the so-called Beachy Head Lady was recreated using craniofacial reconstruction. Eastbourne Borough Council's museum service was awarded a grant of £72,000 by the Heritage Lottery Fund for the Eastbourne Ancestors project. The aim was to identify the gender and age of each skeleton in its collection. Detailed scientific analysis of more than 300 skeletons of people who lived in the south of England thousands of years ago has undertaken by scientists and archaeologists. Testing of the bones and teeth has identified the national or regional origins, age, gender, state of health, diet, and in some cases, how they died. Most of the skeletons are Anglo-Saxon, from about 1,500 years ago, but some are Neolithic and more than 4,000 years old. The Beachy Head Lady was discovered in the East Sussex beauty spot in 1953, and she is thought to have lived around AD245. Jo Seaman, heritage officer at Eastbourne Borough Council, said: "This is a fantastic discovery for the south coast. "We know this lady was around 30 years old, grew up in the vicinity of what is now East Sussex, ate a good diet of fish and vegetables, her bones were without disease and her teeth were in good condition." The Beachy Head Lady forms part of an exhibition at the Eastbourne Museum which is opens on 1 February at the Pavilion.